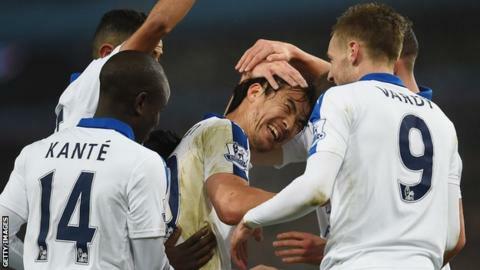 Leicester City returned to the top of the Premier League with a draw at bottom-of-the-table Aston Villa. Shinji Okazaki opened the scoring for City, reacting quickest to poke home after keeper Mark Bunn had athletically clawed out Jamie Vardy's lob. Riyad Mahrez missed a chance to double the lead after Leicester were awarded a controversial penalty for handball. But Villa striker Rudy Gestede levelled after his second-half shot deflected past keeper Kasper Schmeichel. Leicester are now a point clear of Manchester City and Arsenal at the top of the table, but the Gunners will go back to the top if they get a point against Stoke on Sunday. It might be over-exaggerating to say Villa have turned the corner after their fans' furious reaction to the draw with Wycombe in the third round of the FA Cup, but after manager Remi Garde's first win in midweek, there will be more optimism around Villa Park now. Whereas in previous fixtures heads had dropped after going behind, on Saturday Villa continued fighting and they had more of the ball and won more battles than the league leaders. They still have defensive frailties, none more obvious than when Vardy was afforded time to get onto the end of Schmeichel's long clearance. Bunn may have backtracked well to keep out his lob, but his defenders were too slow to the rebound, letting Okazaki in for the opener. The success of Claudio Ranieri's men so far this season has primarily been built around two key men, Vardy and Mahrez. Between them they have 28 goals and 10 assists in the Premier League, and while Vardy - who has just come back from a minor operation - did well for Leicester's goal, he did not look as sharp as when on his record-breaking streak earlier in the season, and missed a chance to win it in stoppage time when he fired over from a tight angle. Mahrez's weak penalty - his second missed penalty in a row - will be a frustration to his manager, as will Leicester's inability to finish the game when in front. The main talking point of the first half was Leicester's penalty decision. It was the assistant referee who flagged for Aly Cissokho's handball, but it simply added to the recent confusion over the rule. The Villa defender had dived in to block Mahrez's shot from a couple of yards, but the ball struck his arm up by his face with Cissokho facing the other way. The home side had their own strong claim for a penalty in the second half when Leicester defender Robert Huth wrapped his arm around Libor Kozak's head to get to a cross first, but the referee turned down the appeal. Leicester manager Claudio Ranieri: "Yes, we lost two points. We started very well and scored a goal but after the missed penalty the Aston Villa players took a new energy. "If we score a second goal, we close the match. We are very sad but also I say to the players 'if we make the performance the result is not important'. "It's one point, it's OK, it's a derby - but we are disappointed." Aston Villa manager Remi Garde: "If you look at the two games we've played we can be pleased about the spirit. These players have the right attitude to try to save the club from relegation. Sometimes it takes time. "If there is pre-season it's because it's useful and when you don't have pre-season to work with your team it's more difficult. I didn't have this time and when I arrived the team had lost seven games in a row. "I know my face was new in the dressing room - my language as well - but it doesn't take hours to put it right." Shinji Okazaki has now scored five goals for Leicester City in all competitions, all of them coming away from home. The Foxes have now been top of the Premier League table for 33 days this season, the same number of days that Spurs have been top of the PL table since its inception in 1992 (based on end of days). Rudy Gestede scored his first Premier League goal in 10 appearances for Aston Villa at Villa Park. Aston Villa have seen a substitute score on just three occasions in the Premier League since 22 September 2013 - two of those have been scored by Gestede. The Foxes' run of six hours and 11 minutes without conceding a Premier League goal was ended by Gestede's goal. Both sides have FA Cup third round replays to take care of. Aston Villa host League Two Wycombe Wanderers on Tuesday night, while Leicester are at home to Tottenham Hotspur. Match ends, Aston Villa 1, Leicester City 1. Second Half ends, Aston Villa 1, Leicester City 1. Substitution, Aston Villa. Scott Sinclair replaces Jordan Ayew. Libor Kozák (Aston Villa) wins a free kick on the right wing. Foul by Christian Fuchs (Leicester City). Attempt missed. Jamie Vardy (Leicester City) left footed shot from the left side of the box is too high. Assisted by Daniel Drinkwater with a through ball. Foul by Jordan Veretout (Aston Villa). Demarai Gray (Leicester City) wins a free kick in the attacking half. Attempt missed. Libor Kozák (Aston Villa) right footed shot from the centre of the box is too high. Assisted by Rudy Gestede with a headed pass following a set piece situation. Hand ball by Leonardo Ulloa (Leicester City). Substitution, Leicester City. Demarai Gray replaces Marc Albrighton. Leandro Bacuna (Aston Villa) is shown the yellow card. Jamie Vardy (Leicester City) is shown the yellow card. Offside, Leicester City. Christian Fuchs tries a through ball, but Jamie Vardy is caught offside. Attempt blocked. Idrissa Gueye (Aston Villa) right footed shot from outside the box is blocked. Assisted by Libor Kozák. Offside, Leicester City. Daniel Drinkwater tries a through ball, but Jamie Vardy is caught offside. Idrissa Gueye (Aston Villa) wins a free kick in the defensive half. Attempt missed. Daniel Drinkwater (Leicester City) left footed shot from outside the box misses to the right. Assisted by Jamie Vardy with a headed pass following a corner. Corner, Leicester City. Conceded by Jores Okore. Robert Huth (Leicester City) is shown the yellow card. Goal! Aston Villa 1, Leicester City 1. Rudy Gestede (Aston Villa) left footed shot from the centre of the box to the top right corner. Rudy Gestede (Aston Villa) wins a free kick on the right wing. Corner, Aston Villa. Conceded by Christian Fuchs. Foul by Daniel Drinkwater (Leicester City). N'Golo Kanté (Leicester City) wins a free kick on the left wing. Joleon Lescott (Aston Villa) wins a free kick in the defensive half. Substitution, Leicester City. Leonardo Ulloa replaces Riyad Mahrez. Attempt missed. Libor Kozák (Aston Villa) header from very close range is high and wide to the left. Assisted by Jordan Veretout with a cross following a set piece situation. Jordan Ayew (Aston Villa) wins a free kick on the right wing. Foul by N'Golo Kanté (Leicester City). Substitution, Aston Villa. Rudy Gestede replaces Carles Gil. Attempt missed. Daniel Drinkwater (Leicester City) right footed shot from the centre of the box misses to the right. Assisted by Jamie Vardy with a cross. Attempt saved. Leandro Bacuna (Aston Villa) left footed shot from the centre of the box is saved in the centre of the goal. Assisted by Jordan Ayew.